Imagine yourself in a magical balloon floating high above the world or as a soaring eagle. 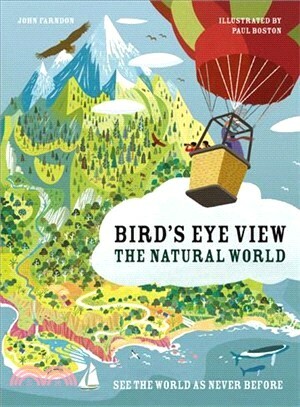 Bird’s Eye View: The Natural World takes you on an amazing aerial journey to show you the world in a way you’ve never seen it, in a series of spectacular panoramic views, complete with annotated information. Some panoramas fold out, making fabulous wide-frieze pictures as big as a poster. In this book, you will trace the remarkable migration of the wildebeest across the East African plain, see the extraordinary changing habitats as you soar past the slopes of the Himalayan slope, and many other natural wonders. Look at the world differently, with a bird's eye view. John Farndon is an internationally renowned author of exciting and accessible science books for children and adults. His books have been shortlisted for numerous awards and have sold millions of copies worldwide, proving their perennial appeal. Paul Boston studied illustration and sequential design and has been illustrating for over 15 years. He lists his inspirations as 1950's children's books, antique maps and Japanese prints, to name just a few. Paul's charming depictions of people and places have been commissioned for global advertising campaigns and publishing projects.